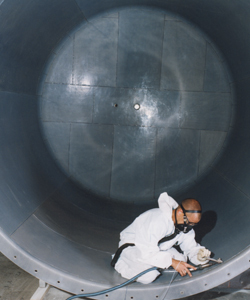 Sheet linings provide excellent corrosion protection and prevent high purity products from contamination and abrasion resistance to the base material by creating a coating of a different material. Electro Chemical produces sheet linings made from fluoropolymers and sheet lining, for example, makes it possible to line or repair on site super large tanks in excess of 100m³. 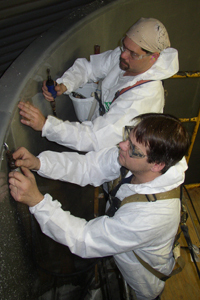 Sheet Linings are joined, requiring high level welding techniques. 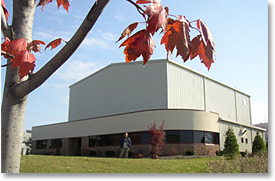 Specialized techniques and quality management are very important for this lining and Electro Chemical has the experience and expertise to handle difficult projects effectively. Electro Chemical can provide these services at their location or in the field at your location. Neoflon® is a registered trademark of Daikin. Tefzel is a registered trademark of Chemours. APV is a trademak of DaiKin, Toho Kasei, TFM is a trademark of Dyneon LLC. Hyflon, Halar are trademarks of Solvay Solexis. Kynar is a trademark of Arkema. Enduroflex is a trademark of Blair Rubber. Triflex is a trademark of Polymeric. Hypalon is a trademark of Dow. Koroseal is a trademark of Polymeric. Please contact us for any of your sheet lining needs.